Callum Hudson-Odoi in action for the Blues earlier this month. Maurizio Sarri has been assured by Chelsea that Callum Hudson-Odoi will not leave the club in January. The winger has been widely linked with a lucrative move to Bundesliga champions Bayern Munich, although Chelsea have reportedly turned down a transfer request from the player. Head coach Sarri is now confident the Blues will keep Hudson-Odoi this month and potentially heading into next season, with the former Napoli boss pleased with the development of the teenager in recent weeks. “As you know, I don’t have the power to sign a new contract [for him],” Sarri told a news conference on Tuesday. “On the pitch, I am very happy with him. The club have told me that, in this transfer window, he will remain with us for sure – and very probably in the next, too. I am really very happy with this. 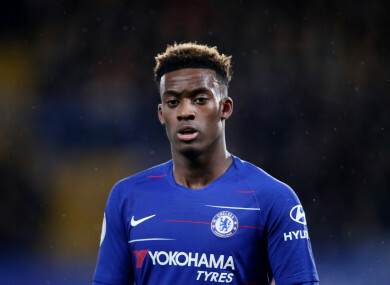 Hudson-Odoi has yet to start a Premier League game but scored against Sheffield Wednesday in the FA Cup on Sunday. Sarri added: “I am not frustrated [with the speculation] because, on the pitch, he is doing very well. I am not happy with the situation but every big team has the same problem. It is not easy to keep these young players. He is one of the best 18-year-old players in Europe. Speculation surrounding Hudson-Odoi escalated after he reportedly turned down the opportunity to sign a new contract at Stamford Bridge, but Sarri is still not willing to make promises to the player. Email “Chelsea's 18-year-old star winger will not leave despite transfer rumours, says Sarri”. Feedback on “Chelsea's 18-year-old star winger will not leave despite transfer rumours, says Sarri”.